Climb up through the tall, impressive, cliff walls of Death Canyon to the peaceful, upper stretches of the canyon on this out-and-back hike. This trail starts in a lush forest, and crosses many feeder streams as it works its way up. The forest gradually gives way to more open landscapes and glimpses of the surrounding mountains before climbing up to Phelps Lake Overlook at the top of the ridge. Phelps Lake stretches out below you from this picturesque perch. Continue on through the trees and open meadows as you switchback down into the valley below. The mighty walls of Death Canyon come into view as you get closer. Stay right at the junction to turn up towards the canyon, eventually coming up to the unnamed creek that exits the canyon. 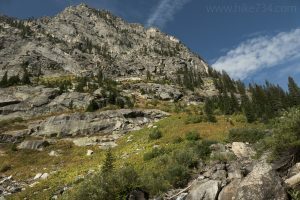 The climb up through the canyon is a combination of trees and boulder fields alongside the creek. Views back out the canyon give you fleeting glimpses of Phelps Lake, while the scenery into the granite walled canyon is stunning. The creek is a constant cascade of waterfalls through the boulder fields. Eventually the trail begins to level out as you enter into the upper stretch of the canyon. The creek slows and the vegetation grows tall. You pass the trail for Static Peak Divide and a patrol cabin. (See Static Peak Divide for description.) From here, explore the serene landscape until you’re ready to turn around and head back the way you came.